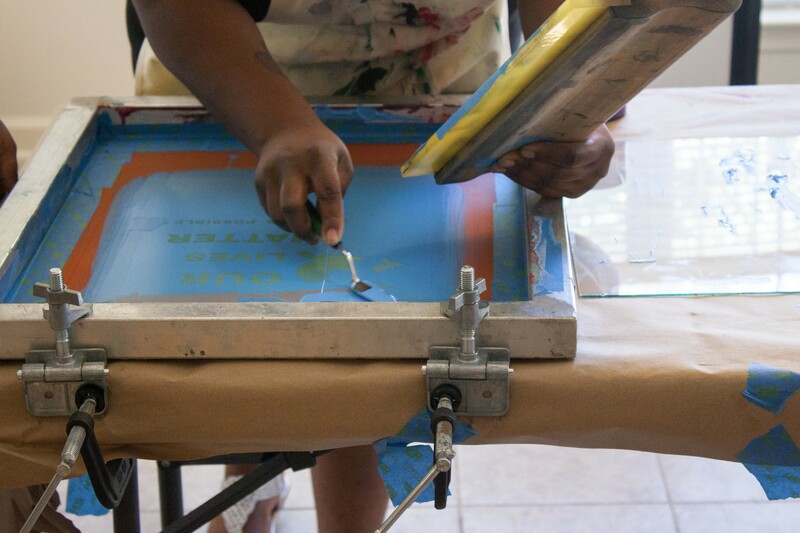 Apprentice Ca’Terrya Hilson works on screen printing during an exhibition hosted by the Klondike/Smokey City Community Development Center. Blocks away from Northside High School, girls aged 15 to 19 spent several months learning art and other skills from mentors at the Klondike/Smokey City Community Development Center in North Memphis. The program began in March 2016. The next month, the number of girls went from eight to seven when a 15-year-old apprentice in the program died violently. Mentor and visual artist Drea Powell said that the death was sobering to the girls. For some, it fueled them, while others wanted to retreat. Creating art and journaling served as outlets for the girls. The work made them confront their feelings about their friend's death and other issues they were facing. Visual artist Brittney Bullock, who served as project lead, said she first developed a professional relationship with CDC Executive Director Quincey Morris while working at Crosstown Arts. Bullock then volunteered for the CDC and continued to attend the monthly neighborhood partnership meetings. When the community engagement grant was offered Bullock asked Morris if the CDC would apply. Bullock said Morris initially said “no” because she had no one to manage the project. The two landed on the apprenticeship model after talking about their interests (Bullock’s in community engagement work and youth development and Morris’ in community development and providing resources). Khara Woods, a local designer and photographer, served as a mentor to the participating girls. “Watching them grow has been amazing,” Powell said. Through the apprenticeship, the girls were paid a stipend and worked four hours on two Saturdays a month. The grant money ran out in September. When they decided what to work on, the girls landed on screenprinting. They learned how to set up the entire process and work with different colors for prints. 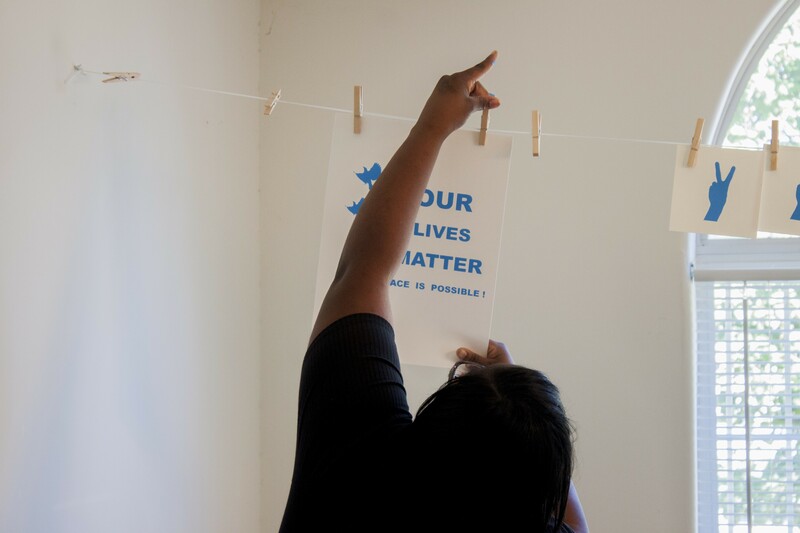 Apprentice Ca’Terrya Hilson hangs a screen printed piece to dry during an exhibition hosted by the Klondike/Smokey City Community Development Center. A show and sale of the prints was held on October 29th at the CDC. One piece reads “Reach for the stars” — a note of hope and possibility — and shows a chorus of hands reaching towards a group of stars. Another reads “Our Lives Matter,” a way for the girls to personalize the Black Lives Matter movement. A third reads “Fear - Violence = Peace.” Peace is represented by the peace sign, while violence is symbolized by a gun. Throughout the CDC’s office are large sheets of white paper listing the skills the girls worked on during the camp, such as branding and product development. The lists were flanked by large prints of the girls and their mentors. Part of the apprenticeship included the girls visiting the studios of professional, working artists to show that entrepreneurship and working as an artist could be a viable path. The mentors even brought in their work and showed client receipts as part of that process, Powell said. Sixteen-year-old Ca’Terrya Hilson applied for and was accepted to the program after hearing Bullock speak about the opportunity at the Boys & Girls Club. Hilson said she had not previously worked with art, but found painting to be her favorite part of the experience. Morris said that she continues to follow up with the girls, to encourage them ib things such as taking their ACTs and applying to college. Morris said with additional funding she would like to continue the program and expand it to more girls, and eventually boys.